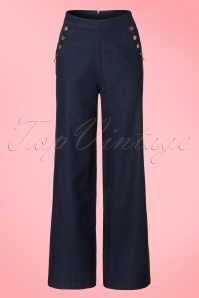 This 40s Samantha Trousers is everything you need! Denim is inarguably an all year classic, but when it comes to summer styling, you've got to switch it up. 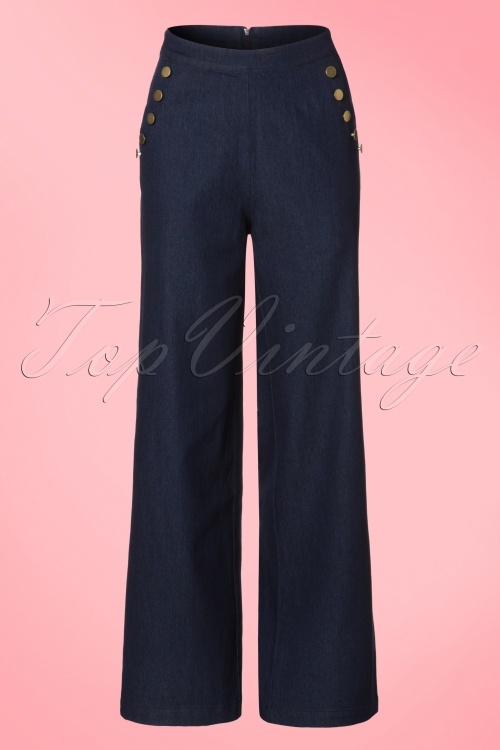 Add some necessary chic to your denim collection with these feminine, fierce, 40s inspired trousers! 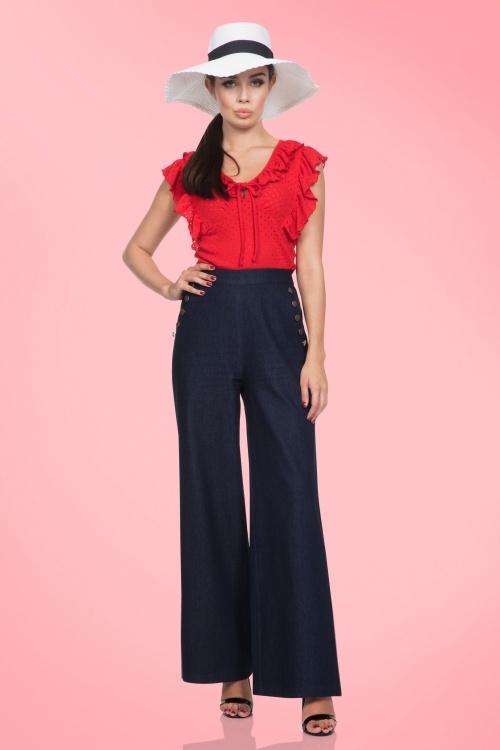 The wide legs form a beautiful contrast with the high waist and is very flattering, also with fuller hips/bottom. 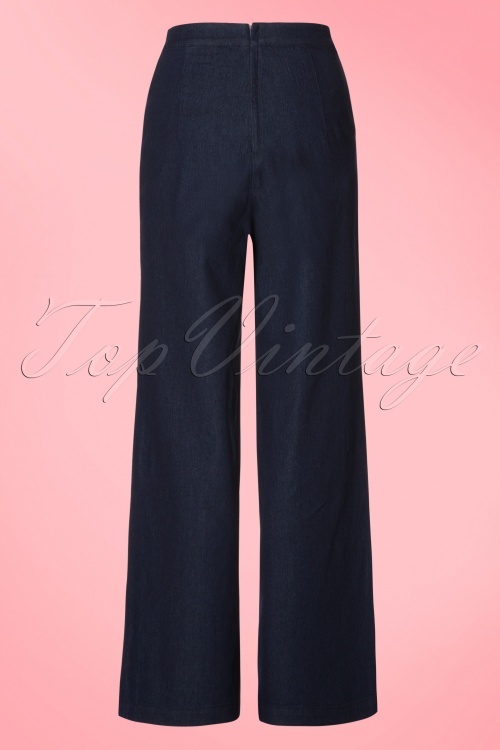 Made from sturdy, denim blue cotton with a light stretch for a lovely fit. Samantha gives you a classic look with a Vixen twist, must-have! I love the dress. Fits perfectly in XS with a small waist at 173cm. Lovely fabric too; thick and soft and doesn't easily crinkle. Very chic cut and you cannot beat the price! Unfortunately, the trousers were too big for me even at XS. 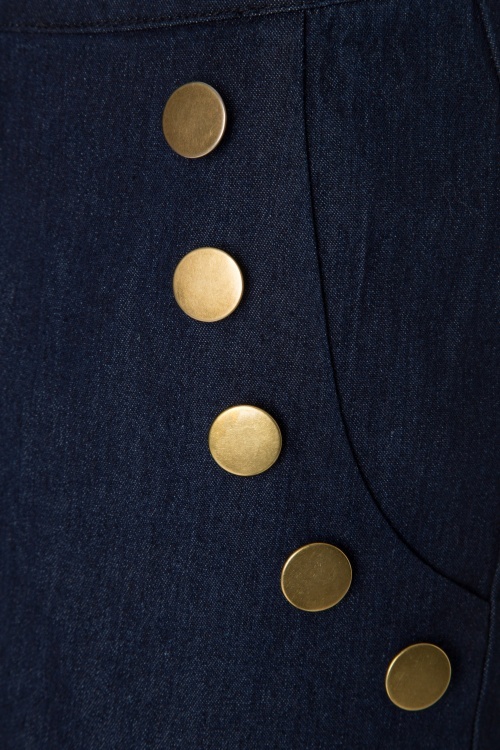 I just cannot seem to find high-waisted trousers that fit... but the fabric and cut are lovely! De broek is superfijn maar staat me helaas niet zo mooi. Ik denk als ik wat langer was dat ie wel had gepast. (1.62). Het rode topje is supermooi en is goed te combineren. Kleur en kwaliteit is super ! Der Stil der Hose gefällt mir und der Stoff hat eine gute Qualität. Leider ist es schon das zweite Mal, dass bei einem Kleidungsstück der Marke "Voodoo Vixen" der Reißverschluss kurz nach dem Kauf kaputt geht. Ich werde mit der Hose zum Änderungsschneider gehen, denn ich möchte sie gern behalten. Ein bisschen ärgerlich ist es schon. Hallo Petra, entschuldigen Sie uns bitte dass der Reißverschluss defekt ist. Natürlich ist das sehr ärgerlich, das kann ich mir sehr gut vorstellen. Ich werde mich heut noch bei Ihnen melden mit einer passenden Lösung.